As I was anxiously watching the third batch of Fleur de Sel Caramel bubble itself up to soft-ball stage, I was sending prayer after prayer up the stainless steel chimney hood to the Gourmet Gods that the caramel would set properly. This was my third attempt. What if the caramel didn’t set up? Ooooh. So WHAT if it didn’t set? There, staring at me from the kitchen windowsill, were six very cute 1/2 cup jars that I’d picked up at World Market days earlier. I’d intended on making homemade dulce de leche to add to gift baskets but I didn’t want to boil the cans and the in-the-oven method I tried the day before went terribly wrong (that poor pie plate might never be the same). Just like that, the jars had been repurposed. Thick and creamy and studded with tiny flecks of vanilla bean, the sauce is fantastic warmed and drizzled on a steamy mug of whipped cream-topped dark hot chocolate. 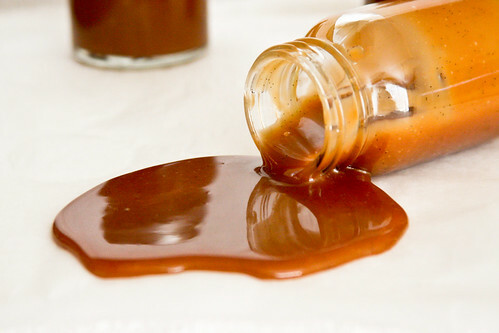 A sweet & salty caramel sauce with vanilla beans, perfect for serving over ice cream, swirling into brownie batter, and a hundred other uses. Use a knife and slit the vanilla pod in half along the length of the bean, stopping about 1/2 inch from the end (this way, the pod stays in tact for easy retrieval and disposal). Scrape each side of the pod with the knife and place the beans and pod in a small sauce pan. Add cream, butter, and salt to the sauce pan and warm until boiling. Boil, without stirring but gently swirling pan, until mixture is a golden caramel. Pluck vanilla pod from the cream mixture and carefully add the cream mixture to the caramel (mixture will bubble up) and simmer, stirring frequently, for 3 minutes. Pour into heat-safe glass measuring cup or dish (that can accommodate approx 3 cups). Let sit until cool. Pour into small glass jars and store in the fridge. Warm the sauce and use in dark hot chocolate, bread pudding, over ice cream and cheesecake, or on pancakes and french toast. good gracious, i hope that caramel in the picture didn’t go to waste! One thing I’m a bit curious about is why you’re heating the cream, etc prior to mixing in with the caramelized sugar (for the vanilla?)? I would think that warm/hot cream would run the risk of burning the caramel? You are a serious genius. I would never have been able to repurpose like you. Thanks, Blake! PB dulce sounds *terrific*, but alas, I’ve had almost no success recently making my own. The boil-in-can method keeps the condensed-milk-turned-dulce pourable but it’s definitely not my favorite method because of the risk of the dulce bomb going off in the kitchen. The little jars came from World Market, I found them in the “canister” aisle. I love your photo! It looks so decadent! Thanks for sharing. What a great gift idea! I’m very happy to have discovered your blog. So many yummy things and such beautiful photos. I’ll be back for sure! I haven’t been to the site in a while… it looks absolutely great!! 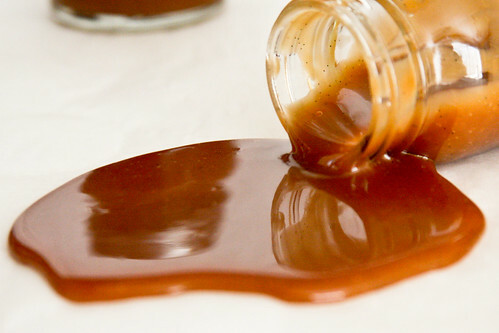 And what a funny co-inky-dink, I just made dulce de leche as well. You’re looks great, I wish I had added salt to mine!! Mmmmmmmmmmmmmmmmmmm…… Love the addition of the salt, too. 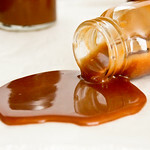 Oh my that is just luscious looking caramel sauce. That is one counter top I would lick.